So, what do I tote around town on a given day? It’s pretty average for a Regular Guy with a gun, in my opinion. Heckler & Koch VP9 chambered in 9mm with a 15 round magazine. 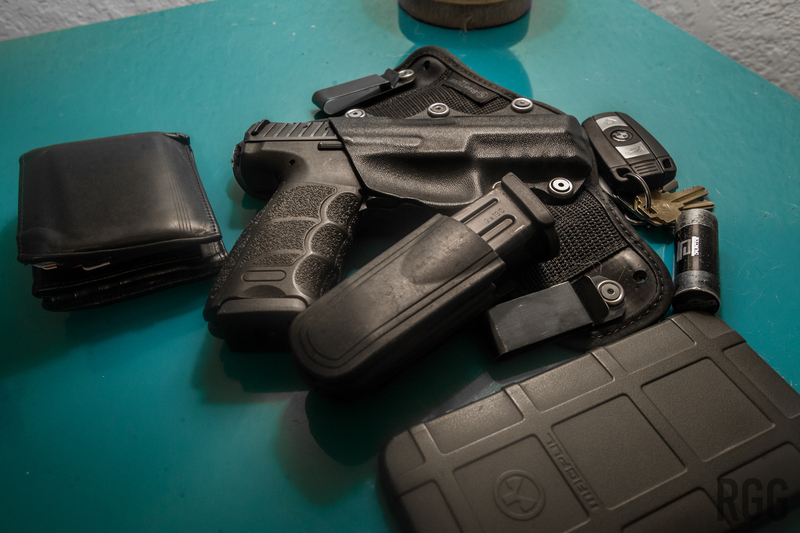 The VP9 is encased by a Stealthgear USA IWB (inside-the-waistband) holster. It’s pretty nifty. Spare 15-round VP9 magazine in a Safariland universal magazine pouch. Better to have too much than not enough. A Magpul iPhone 6 Plus field case. They don’t make these in this specific color (olive drab) anymore. Little Drumcode promo-item cylinder for earpro.